Oh I’m cracking up over the “goodboygoodboygoodboy”. We’ve had to do this a time or two, never once our Kylie has seen the distraction but preemptively. We’ve been working on our own “too bad”, using some of the tips you’ve shared in the past. But we are well versed in the skipping, jumping, endless praise run into the house/car/closest safe place! Hi, thanks for the post. I always read tour blog. Tell me Doodlebug, how did your mom teach you these commands and what worked best for you? Superb. I use “leave it” for a multitude of situations when I want my dogs to leave whatever alone be it a bottle of wood polish, a person, or another dog. And I haven’t used my “stay where you are” for Justus yet. He knows when I hold my hand out like a stop, he downs; the idea being, should he be far from me and I want to stay where he is, I can raise my arm with my “stop” hand aka show me the paw and he will down. LOVE Doodlebug’s reaction and your constant training. I am currently training our 2-year-old bluenose Pitbull (Kita). I tried to do it myself, but found that working with a professional trainer was a better choice. 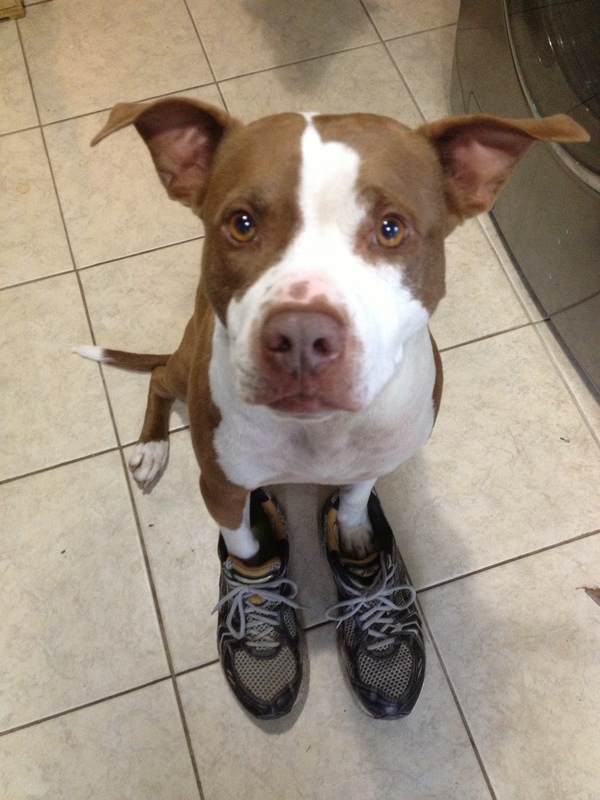 How do you train a pitbull to stay when the office door is open? We’d like to have the office door open with Kita, but there are other dogs around (including five elsewhere in the building). Any pointers? Love! In your experience does one of those get taught before the other or does one help learn the others? Nope, we teach all in basics class… It is the proofing against distractions that takes the most time and effort! I would love to read more about “too bad” and the ways it varies from “leave it.” Glad to see a post from you guys! Good question… Our “too bad” is broader than “leave it.” Essentially, it means “you have broken a rule.” It applies to taking unauthorized things (a la “leave it”) but also other rules like getting on furniture, barking out the window, etc. It is also taught without any intimidation tactics like grabbing collars, yelling, or yanking leashes. These are so important and my dog definitely needs some work on it. We taught him “leave it” as stop doing that. We would use the command out on walks when he would stop to smell something. It was so easy to correct the behavior and teach the command because we just had to keep walking and he would give up and follow us once his leash became uncomfortable. Great post! Glad to see you guys again! I totally agree with these commands! I work with dogs so I can’t tell you how many times a dog not knowing these commands have made things EXTREMELY difficult. Great post and totally agreed. I hike with my dog off-leash a lot, and can only do so comfortably because she Comes and Leaves It on command. People often remark how well-behaved she is. The training really does pay off!! we worked with rescue pitbulls and had a lovely girl Janey. She had been chained to a fence near a crack house, and thus was very sensitive to free dogs. We would walk her, and feed her treats whenever another dog was near to teach her not to be afraid. Janey loved to play, and we would play with a pull toy with her, but my wife Jan taught Janey “Leave It” which meant she would let go of the toy. One day walking Janey on her leash, a neighbor’s dog got loose and attacked Janey. Janey quickly had the other dog down when my wife hollered “Janey Leave It” and Janey let go. You can bet she got some treats then! The story ends well, because Janey got way better with other dogs and now has a forever home. It is so important to be able to control your dog, they really depend upon us to keep them safe. Doodlebug, you’ve learned so well, and I know your brother Chick has too. In your humble opinion, is it ever too late for a dog to start learning these things? I have 2 of those yappy dogs you mentioned, and they’re about 14. I do believe that recall is the number one behaviour every dog needs. If your dog knows and sees great value in stopping what he or she is doing and immediately racing back to you, it can save his or her life. Unfortunately, it can also be the hardest to perfect. With a world full of distractions I have to work on this every single day with Shiva or it will slip. I love the words you use: “too bad”. Our “leave it” has basically been tossed out as the words have no meaning for Shiva any more. She has ignored them for so long. But I haven’t been able to find a quick enough phrase to replace them so we can start training it all over again. Too bad is just too perfect. I hope you don’t mind me swiping them! We have our own commands too, but sometimes we just can’t resist the temptation of a wabbit. Fabulous! I use “leave it” with all of my dogs, but especially my overly-enthusiastic coonhound. It works in lots of situations. I also rely on “off” a lot. But, my favorite trick is “look at me,” something a local trainer taught me. Whenever my coonhound is behaving badly and ignoring me, the “look at me” command gets her to do so every time. Once she has made eye contact, it’s pretty easy to get her to listen. Just stumbled across your blog and I fell in love. The concept, writing style, just about everything. Take care. I normally consider my dogs to be well trained but they are certainly not on the level of stopping on a dime mid chase! That is amazing and definitely inspires me to put some more time into the Stop and Come commands! I also taught my dog GO HOME. Because if your dog is ever wandering around, that is usually what people tell it. In her decade and a half, she never did hear it from anyone but me, but it was a nice trick for when walking with friends, to let the dog lead them home. I agree these are essential commands for any dog, can you recommend a breed that is easy to train? It’s been over 5 months! We miss hearing about the Dude and Chick! This is so important. Thank you for sharing this! ^ “ISO 32000-1:2008 – Document management – Portable document format – Part 1: PDF 1. If someone just dropped by and handed your child an Easter bunny (a live one), you might have a bit of a problem. some pictures or figures of speech to provoke you. I took Kita (our bluenose pitbull) in for training classes. First class was basic obedience (come, sit, stay, down, etc). We are now on the refresher and second-level class (behaving around other dogs, mostly). a surprise as the console version has yet to acquire even half of the DLC that has been obtainable on Pc. DLC’s is a step forward, it does small to alleviate the problem for these who have already masked up. Great post however , I was wondering iif you could write a litye more on this topic? Also, dogs respond really well to consistency of commands. The 3 essential commands that you mention work really well when the dog automatically recognizes the voice command as well as a hand command. I just adopted a 1.5-2 year old pit. She is the sweetest thing ever, but still super anxious. Moving into the city is a big change – so many more smells and sounds! I’m really keen to be the best dog-mama for this lovely lady. So I’m so glad found your blog. Thanks! I totally agree with these commands! I always read your blog. Thank you for sharing this.